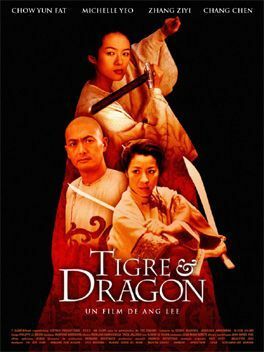 Crouching Tiger, Hidden Dragon (traditional Chinese: 臥虎藏龍; simplified Chinese: 卧虎藏龙; pinyin: Wòhǔ Cánglóng) is a Chinese-language film in the wuxia (chivalric and martial arts) style, released in 2000. A China-Hong Kong-Taiwan-United States co-production, the film was directed by Ang Lee and featured an international cast of ethnic Chinese actors, including Chow Yun-Fat, Michelle Yeoh, Zhang Ziyi and Chang Chen. The movie was based on the fourth novel in a pentalogy, known in China as the Crane-Iron Pentalogy, by wuxia novelist Wang Dulu. The martial arts and action sequences were choreographed by Yuen Wo Ping, well known for his work in The Matrix and other films. Made on a mere US$15 million budget, with dialogue in Mandarin, Crouching Tiger, Hidden Dragon became a surprise international success. After its US premiere at the Hawaii International Film Festival, it grossed US$128 million in the United States alone, becoming the highest-grossing foreign-language film in American history. It has won over 40 awards. The film won the Academy Award for Best Foreign Language Film (Taiwan) and three other Academy Awards, and was nominated for six other Academy Awards, including Best Picture. The film also won three BAFTAs and two Golden Globes, one for "Best Foreign Film" as well as additional nominations for ten BAFTAs including "Best Picture".